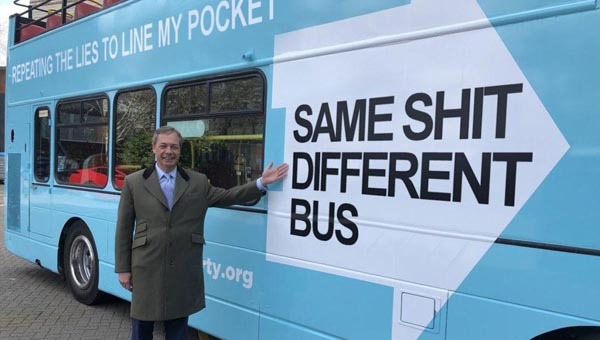 do you not feel you are being a little harsh on Farage's party when after all it has only cost the tax payers around £50,000,000 over the ywears for UKIP to achieve the sum total of - come to think of it, beyond defame and malign a lot of people, wind up with MEPs in prison, lie to the Courts and to the police. Then of course there was the way in which they seem to have slept their way into the choice of all too many of their staff, lied on a consistent basis both to Regional Committees, electorate and members about their various thefts and sordid corruption. Might it be what seems to have been over egging the rigging of a vote to do away with member's democratic input and turn the party into a one man band dictatorship with appointed pond life and low lifes doing as Farage orders as he hold the purse strings, all staff appointments, positions in selection lists, and of course it seems he hold the rigging rights for votes! Might their achievement be to have pulled together a leadership clique that hold onto office by bribery and intimidation? Could it be the facility of stealing money to use as bribes just as Tom Wise did though he was rightly sent to prison for his criminality! One wonders why Derek Clark was not also as he was ordered to repay almsot exactly the same sum which he had misappropriated and Nigel Farage, Graham Booth, and Jeffrey Titford were also ordered to repay money to the public purse. I note you also do not know what happened to the money taken from the public purse by Farage, Lott, Croucher etc. for a petition which was never presented and were you not a staffer at the time! Seems UKIP leadership are consistent on one count - corruption. Farage has time and again gone on public media and outright lied just as Malcolm Pearson lied when leader to deselect Nikki Sinclaire becauser as an MEP she was showing up the other UKIP MEPs with the transparency of her accounts and her dedication, ethicality and workload (a sure way to make enemies in UKIP!) currently Stuart Agnew and David Bannerman are, I am reliably informed - still under investigation by OLAF for their abuse of trust in elected office and misuse of public money (as with Tom Wise who went to prison for his crimes). Interestingly UKIP make much of trying to befoul Sinclaire's neame yet OLAF have absolutely no interest in investigating her despite what seem to be 'set up fantasies' spun to West Midlands Police by John Islon seemingly for his preferment in political rivalry as promised by UKIP and since only one man in UKIP makes the decisions clearly he must have authorised the attempted set up! Sadly Gary - your posting is accurate and it is clear there isn't a single solitary achievement of note for the £50,000,000 or so we, as tax payers, have permitted UKIP to steal, purloin, squander and abuse. Yet it is possible to achieve as an MEP as Nikki Sinclaire has most ably shown even using her own money for the cause where the rest of UKIP leadership seem to think paying money for their own election is some sort of magnanimous gesture - beyond that what money has ANY UKIP MEP ever donated to the good of the party? So sad when they had such potential and hardly surprising they try to jump on every passing band wagon! In reality UKIP leadership are beneath contempt - just a gaggle of racist, abusive self seekers of little or no merit!